. . .wow. 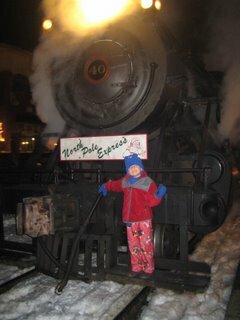 last night we rode the polar express in new hope, pa.
now, we have been on the ivyland railroad before, but last night was pure magic. we dressed ryan in hi jammies and told him we were going for a surprise. when we pulled in, the jig was up. he was very excited, even though he tried to be grumpy. . .it didn't last long. chugging along behind that massive steam engine, in the cold, in the woods, with snow on the ground. . .pure magic. the railroad really does it right - they serve hot chocolate and cookies, santa is on the train, and on the ride th the "north pole", you listen to the story of the polar express. what a great holiday memory. . .